The Energy Star Portfolio Manager allows the building owner to track and assess energy consumption while comparing the building’s performance with a national database of buildings with the same operating characteristic. The result is a rating on a scale of 0 to 100, with 100 being the most energy efficient building in its category. 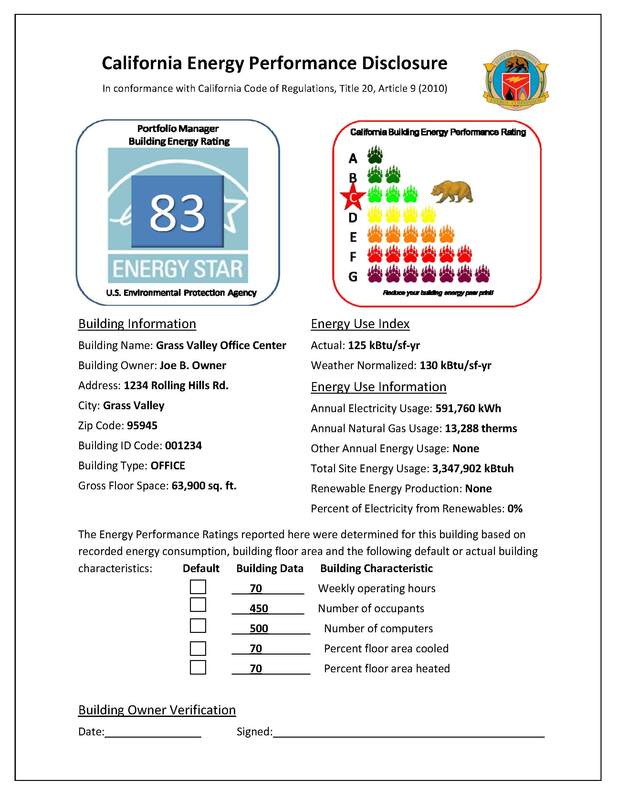 A verified score of 75 or higher qualifies the building for Energy Star certification, which indicates that the building performs better than 75% of all similar buildings nationwide. A higher rating means lower energy costs, lower occupancy costs and higher net operating income (NOI) which also supports higher appraisal. The energy benchmarking for nonresidential buildings is not just a question of compliance but more importantly a question of your competitiveness. In the tight commercial building market the improved energy performance creates a unique selling proposition. Motivators for investment in energy efficiency include cutting greenhouse gas emissions, enhancing the company’s public image and obtaining incentives offered by governments and utilities. Energy performance reports provide an opportunity to cut out the waste in the system and help focus the attention of building owners to optimize the performance of their existing equipment and determine where to make energy-efficient upgrades. Our integrated one-stop-shop approach will not only provide you the benchmarking necessary to comply with AB1103 moreover it will line out the energy saving potential for your building – all of that for one fixed price! This Energy performance benchmark allows our engineering team to tailor an energy efficiency strategy for your building based on your goals, budget and time frame. This entry was posted in Miscellaneous and tagged Commercial building owners, Energy Star, real estate brokers, Statement of Energy Performance. Bookmark the permalink.